This article is about the moles specifically from Super Mario Galaxy. For the recurring moles introduced in Super Mario World, see Monty Mole. 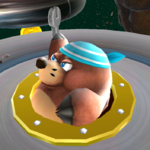 Montys are enemies that appear in Super Mario Galaxy in Battlerock Galaxy, Gusty Garden Galaxy, and Dreadnought Galaxy. They are moles that wear blue, striped bandanas and wield wrenches as their method of attack, which makes them analogous to both Monty Moles and Rocky Wrenches. Montys attack by throwing wrenches at Mario or Luigi, a technique which is also used by a similar enemy from other Mario titles. They retreat into their bunker if the player approaches them, re-emerging as the player moves away. When a Monty is at the surface, the player can either shoot a Star Bit at it or perform a Ground Pound nearby to knock the Monty over, making it susceptible to any attacks, such as stomping or spinning. Mogu Mogu is derived from 「モグラ」 mogura, the Japanese word for mole. The internal file name for the wrench Montys throw is "MoguStone," suggesting that they may have originally been intended to throw rocks, thus making them even more similar to the Monty Moles of Super Mario 64. ↑ "Mario begins his journey on the outer rim of Battlerock Galaxy, standing on a trio of discs. The second and third discs in the collection are dominated by two pesky Montys, molelike creatures that pop above and belowground to hassle the hero. To defeat a Monty, ground pound right next to its hole just as the baddie shows its head. The Monty is flipped upside down, its little feet wiggling in the air. Spin next to the Monty to knock it out of its hole and earn some Star Bits." Black, Fletcher. Super Mario Galaxy PRIMA Official Game Guide, page 110. This page was last edited on July 25, 2018, at 11:54.